Montana Cans: After all these years in the street art, graffiti and all the projects you have done for brands, gallery shows, museum shows, commissions for other artists (like musicians) and so on, how do you feel about your creative process? What would you like to explore in the next year? Felipe Pantone: I feel it’s important for my creativity to be active, prolific, to have a lot of things on the plate. Usually something I find in graffiti applies to my art. Something I do on a mural influences my next painting, and so on. For me it’s important to change disciplines often, there’s always interesting stuff everywhere. 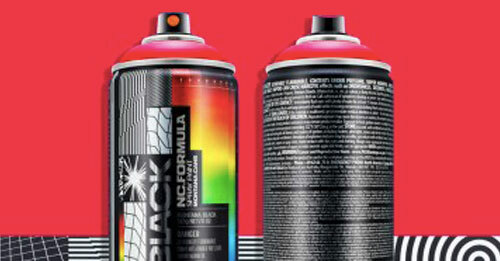 Montana Cans: What can you tell us about your new collaboration with Montana Cans for the Montana Black Artist Series? Felipe Pantone: It’s something that we’ve been cooking for a long time. A personal dream of mine, and something that felt that needed to happen! Montana Cans: Why did you choose that color specifically? If that color would be a person, how could you describe it in three words? Felipe Pantone: I’m very interested in color and human vision, so when they asked me about designing an artist series can, the name “INFRA Red”, really got me. Anything happening between Ultra Violet and INFRA Red gets me. And Beyond. If it were a person, it would be energetic, dynamic, ULTRA. Montana Cans: What does Montana Cans mean for you? 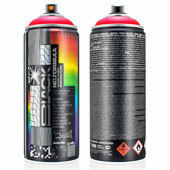 What’s the specific reason why you chose this brand to paint your murals and create your artwork with? Felipe Pantone: I’ve been working with Montana Cans officially since 2005, when they created a series of writers teams all over Europe. I was very young and somehow they made me part of the team. That was very generous of them back then, so I always felt their support until this day. Either way, I wouldn’t be using the brand if it wasn’t because it’s simply the best, in terms of pressure, color brightness, paint quality, durability. 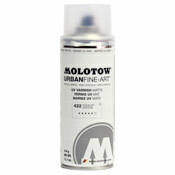 I use it for my murals, for my graffiti, and for my paintings. Montana Cans: Any other favorite color of Montana BLACK chart? Felipe Pantone: Knock Out blue is probably my second favorite. I would have loved to design that one too. Montana Cans: Your background is graffiti, and the meaning/ importance of letters. So how you think you have transcended words into new shapes, colors and data in your artwork nowadays? Felipe Pantone: I found my style in graffiti. I was trying to get my pieces to stand out against the visual pollution in the streets. I wanted my graffiti to be loud so I increased the contrast (pictorially), and I started using vivid colors as well. This way I started exploring optical art, and also elements that reminded of computer graphics, which also influenced my thinking. Like nearly everyone else in the digital era. At some point I simply got rid of the letters of my name to create abstract compositions, but my research kept going in the same direction. Montana Cans: In your perspective, how has the evolution of street art changed the perception of the public space in our generation, and that the Internet and social media have become tools to understand this artistic movement worldwide? Felipe Pantone: Not sure if social media makes you understand, but definitely helps to disclose information so you can see what’s going on beyond your neighborhood through a simple glance at your phone. I guess people now get the global idea of graffiti and street art being something that’s happening worldwide and on a massive scale. Montana Cans: If you could be a piece of art by any other artist, what would you be? Felipe Pantone: This is a tough one. Some days I’d like to be a big Solemn Anish Kapoor, some other days I’d be a Physichromie by Cruz-Diez, and some other days I’d be a funky Paul Loubet. Montana Cans: What’s next for Felipe Pantone? Felipe Pantone: I’m working on a millions of things right now. Future is next, but I’m always focused on the present.